Last year, I wrote an entry that included some of my favorite power training exercises. As those who know me have come to expect, the movements were simple, yet effective. Anyone who has ever trained with me knows that I’m not a fan of complexity. My philosophy is rooted in consistency and hard work with the basics. Much of what I do now in my forties is no different from what I was doing in my twenties and thirties. When something works, I see no reason to reinvent the wheel. 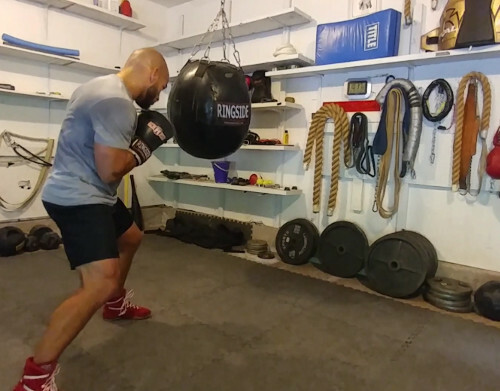 Over the past few weeks, my inbox has been flooded with questions about how to build punching power. I assume the recent spike in interest comes from the attention that the Mayweather vs. McGregor bout has generated. As a result, there seems to be a whole new crop of readers to my site as well as my boxing page. To no surprise, many have landed here expecting a complex formula for power development. Complex programs seem to be more common than ever. Unfortunately, that’s not what you will find here. As a coach, I’m only concerned with what works. I don’t care if it’s new, old, simple, or complicated. If it works, we will use it. It just so happens that many of the best power training exercises are simple in nature. A few examples can be seen below. Clearly, I don’t need anything fancy to develop and display power. The heavy bag, medicine ball, and sledgehammer are three of the best tools you’ll ever find. Each has stood the test of time for good reason. There’s no denying that my approach to training is old school in nature. That doesn’t mean I’m not open to new ideas. It just means that I’ve taken the time to study and learn from the greats who came before. Many of the best fighters to ever walk the planet thrived in the past. 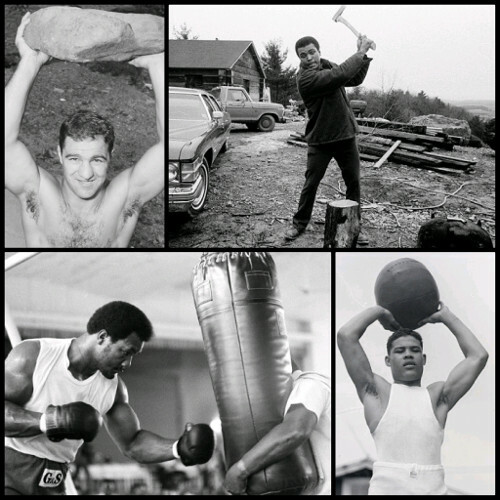 Fight fans will surely recognize those pictured below (Rocky Marciano, Muhammad Ali, George Foreman, and Joe Louis). Each worked hard with the basics and never strayed too far from their sport. As for the success of their methods, the results speak for themselves. Each of these Hall of Fame fighters could have thrived in any era. They were skilled, conditioned, and powerful. Many of their training techniques will never expire. They are just as relevant and useful today as they were in the past. When I’m coaching a professional fighter, we have a singular purpose and that is to win. With that in mind, I am always open to new ideas. I’m certainly not stuck in my ways. Instead, I’m always striving to improve at my job. One thing I’ve learned though is that many of the great trainers from the past knew exactly what they were doing. New and different methods rarely improve on those that have already stood the test of time. Therefore, while I’m always striving to improve, I’m also cognizant of the fact that the old school isn’t nearly as archaic as some seem to believe. Just because something is old doesn’t mean it’s outdated. On the contrary, it might just mean that the exercise is so good that it will outlive us all. Many of the movements that proved useful in the past and will continue to do so in the future. As a boxing coach, I can testify that hitting the bag, throwing a medicine ball, and swinging a sledgehammer are three examples that certainly fit that mold. They will continue to prove useful and never expire. Awesome content Ross. Absolutely loving the articles at the moment. Am on the verge of buying one of your courses. 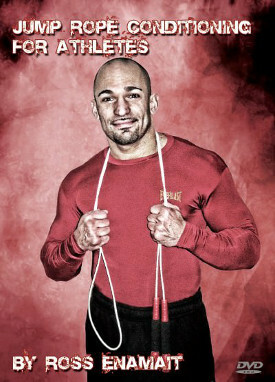 I run a blog called http://www.allfightgear.com would be mega grateful if you could check it out. Always available to do guest posts if you need any! Once again, Ross Great article, keep it up. Being a long time reader of your blog I completely agree. Reminds me of the phrase, “If it isn’t broke, don’t fix it.” Just did a few rounds of skipping and sledge hammer work to finish my session. Simple and effective. That’s wisdom, and I completely agree. You can’t beat the classics. They worked back then, and they still work today. I think that every time I see people on the internet doing these new “functional” exercises. How heavy is that heavy bag? You were rippping into it and it didn’t sway too much. One of the keys to minimizing swing on this type of bag is to hit it while it is swinging back towards you. You then offset the weight of the bag swinging towards you. If you strike while it is swinging away, the bag begins to move out of control.